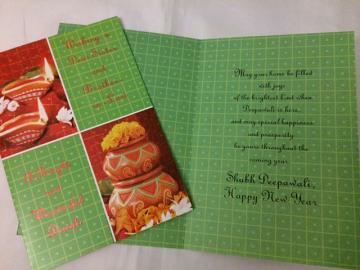 Diwali greeting card for sister and brother in law. A beautiful Happy Diwali Card for your Didi & Jijaji to wish them best for Diwali & New Year. This item in Unique Diwali Gifts category was first added to our catalog on 06-28-2017. Buy Diwali Greeting Card for Sister & Jijaji, sold & shipped by Yaadein where you can shop online for Pooja Samagri, Hindu Statues, Puja Items, Religious Gifts & Home Decor. This Diwali Gifts collection has been tagged as diwali card, greeting, festival wishes, custom, deepavali gifts.